This is a sample entry from Tom Dosdall’s newsletter, Technical Ag Knowledge, published on Wednesday, April 5 2017. It’s another gloomy, rainy day here in Chicago so I figured we could all benefit from a little optimism 🙂 Here are seven reasons why I like owning corn (preferably on the Board vs. physical product in the bin). 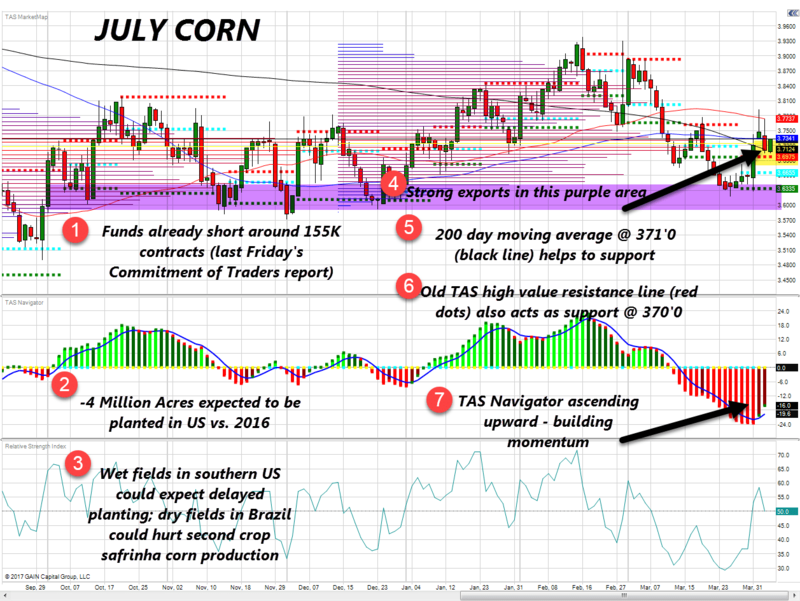 If you are a producer holding on to old crop bushels and this market does in fact start to rally higher over the next few weeks, ask yourself what will happen to basis in your area? Remember, farmers are sitting on record old crop stocks of 8.616 billion bushels (March 1 Quarterly Stocks Report) so a board rally could be negatively impacted by a widening cash basis. Consider locking in basis or selling cash now and re-owning with July futures options. Call 877-566-5463 to make sure this is appropriate for your operation!